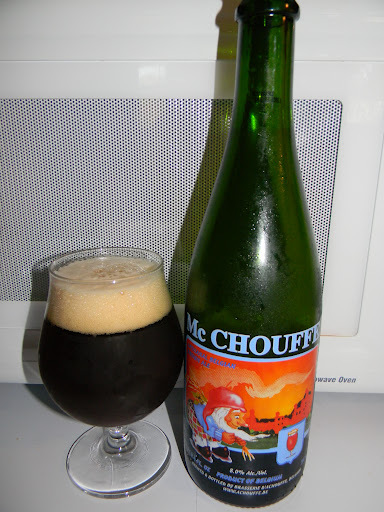 Achouffe | Beer Apprentice - Craft Beer News, Reviews, Interviews and Info. Hi guys. For today’s craft beer review I’m going to be sipping on a La Chouffe produced by the Brasserie d’Achouffe located in Achouffe, Belgium. I’ve been craving a Belgian beer for a few days and this seemed like a good one to satisfy my thirst. From the website, achouffe.be, we find this bit of information regarding La Chouffe. This brew comes in a 25.4 oz. bottle and it has an ABV of 8.0%. It poured a cloudy orange color with a white, soapy, fizzy head. It was sized ok on the initial pour, although it subsided rather quickly. The lacing left a little to be desired, but it did leave a thin film on top of the liquid for the duration. The nose seemed very light, but very well balanced I thought. Hints of fruity pear and grassy hops along with a floral component. Cracker type malts with some Belgian yeast and spices in there too. Also, I received a slight notion of something that smelled very similar to freshly baked oatmeal cookies. I don’t know. Very pleasing whatever it was. The taste was quite yeasty and bready with significant tones of spicy coriander. Like the aroma, savors of fruity pear and clean grassy hops. The bitterness was relatively low, but not overlooked. Just a slight tickle at the back end. I found it to be, overall, very well harmonized and tasty. The mouthfeel was medium bodied. Crisp, dry, lively, snappy, refreshing and thirst quenching. A light spicy bite on the finish with fairly high carbonation. It left a sturdy amount of flavor covering the palate after each sip as well. Another excellent brew in my opinion. Solid all around. A great beer for the Spring and Summer season. Very easy to drink, however containing enough flavor and personality for contemplation. It’s not quite as powerful as some Belgians can be and, in all likelihood, would be a great beer to give someone interested in exploring the Belgian “blonde” style. It’s wouldn’t overwhelm an inexperienced drinkers senses I don’t think. 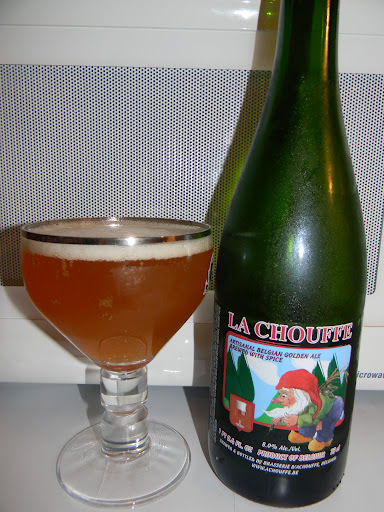 Have you guys ever tried the Achouffe La Chouffe? What was your opinion? Did you like it? Feel free to leave a comment and tell me all about it if you would like. Hi guys. For today’s craft beer review I’m going to be drinking the Achouffe McChouffe Artisanal Belgian Brown Ale produced by the Brasserie d’Achouffe located in Achouffe, Belgium. Let’s just jump to the website, achouffe.be, to see what we can find out about this brew. The McChouffe comes in a 25.4 oz. bottle with an ABV of 8.0%. It poured a hazy brown to burgundy color with an off white collar of near perfect size. It was very soft, creamy and fluffy. The retention time was very good and the lacing was sufficient, soapy and clingy. After settling, a steady film remained on top of the liquid for the duration. The nose revealed suitable bursts of dark fruit. Mostly fig and plums. A very, very light bit of funk was found along with some herbal and earthy hop goodness. A creamy Belgian yeast component fused with spices of clove and light touches of pepper. I began to notice the slightest bit of caramel malt as the brew warmed a tad. Overall, very well balanced, but kind of relaxed and not too overbearing. The flavor announced more dark fruits. Figs, dates and plums. Very similar to the aroma in that it gave off a significant amount of that Belgian yeast, cloves and peppery spice. Again, rather earthy and herbal to expose a bit of “roundness”. The bitterness was medium to light in strength and right toward the end I began to notice just a smidgen of sweetness from the caramel. Not much though. Only the smallest savor of alcohol was noticed throughout the entire drink as well. The mouthfeel was medium bodied. Smooth, mostly dry, slightly creamy and chewy. The carbonation was nice and light while leaving an acceptable dose of flavor behind after the swallow. In conclusion, this is a solid and very good beer in my opinion. Definitely worth a try. It has a lot of nice characteristics that make for an enjoyable experience. The look, feel, aroma and taste all made for an easy drink. This beer would be well received during the Fall or Spring season in my opinion and I may just have to pick it up again sometime to enjoy on a crisp afternoon. So, the next time you see the McChouffe Artisanal Belgian Brown Ale, give it a try and see what you think. I think that if you can appreciate the Belgian style, you may really like it. Thanks for reading and commenting guys. I’m grateful for it. Hello again good craft beer people. Today I’m going to be trying the Houblon Chouffe Dobbelen IPA Tripel produced by the Brasserie d’Achouffe located in Achouffe, Belgium. I’ve yet to try a beer from Achouffe and I’ve heard so many good things about them, so I’m really excited about taste testing this brew. From the website, achouffe.be, we find this description of the Houblon Chouffe. This brew poured from a 25.4 oz. bottle and it has an ABV of 9.0%. The beer appeared to be very cloudy and yellow to gold in color. Quite a bit of sediment was easily noticed as it settled to the bottom of the snifter. From a very gentle pour a white head arose that was a little on the small side. The texture was foamy, soapy, rocky and soft. The retention time seemed pretty good and the lacing looked great. The aroma was a beautiful combination of orange zest and lemon peel. It was very bright and lively. Lightly spiced with what I thought to be both cloves and pepper. Hints of freshly cut grass and Belgian yeast gave it that “earthy” tone and floral aromas kept things on an even keel while only the most minute amount of “funk” was noticed. It didn’t stick around long though because a wonderful hop profile kept drawing me back. A very, very nice bouquet on this beer. The taste was very similar to the smell with only slight variations. Again, citrusy notes of orange and lemon as well as some more of those grassy hops let a solid showing of bitterness tickle the tongue. I noticed the peppery spice also, but instead of cloves it seemed to lean a little more towards coriander. Who knows? Either way they melded well with the overall taste profile. A significant biscuity malt coalesced with the Belgian yeast to really “round off” the flavor. Little to no alcohol was even noticed. Very nicely balanced and tasty. The mouthfeel was medium to medium/thin. It presented a very lively carbonation. It was snappy, but smooth, crisp, refreshing and darn near thirst quenching. It wasn’t quite as dry as I was hoping, but that’s ok. A decent amount of warmth was felt from both the spices and the alcohol and only an “ok” amount of flavor was left behind. I was expecting a touch more considering, but no matter, it was still sufficient. Overall, I thought this was an excellent beer. My first experience with an Achouffe was not a let down. The ease of drinkability was outstanding. I finished this whole bottle in no time flat. This brew had plenty of flavor as well as a wonderful aroma. I could definitely see myself sitting down with this on a Summers night. I’m gonna have to pick up another bottle or two that’s for sure. 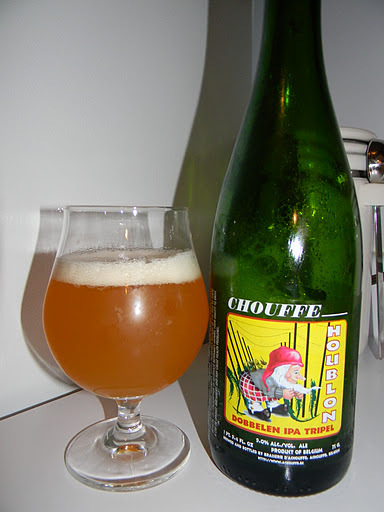 I would have no problem recommending this to a craft beer friend, so pick up a bottle of the Achouffe Houblon Chouffe and give it a try. I would love to hear what you think about it. Thanks for reading and commenting guys. I hope you all are still finding the reviews enjoyable. I still have plenty more to come.